There once was a pencil maker named Peter who puttered around popping out pretty pencils from his place in Pennsylvania. After many months of hard work, he finally finished his first box of pencils and Peter the Pencil Pusher was now enthusiastically pushing those pencils on local store owners and some online stores as well. Peter finally managed to get the local pencil store to carry his box of pencils. He went in there, week after week, but his pretty pencils were still there on the shelf, gathering dust, surrounded by thousands, perhaps millions, of other people’s pencils. Nobody bought his pencils! Peter didn’t understand! His pencils were so special! Why didn’t anybody pick up and pay for his pretty pencils? Peter also listed his box of pretty pencils for sale on the biggest online pencil store in the world. He checked his account, week after week, and just did not understand why nobody was finding his pencils in that huge store! Peter, like many new authors, assumed that his product would somehow “get noticed” or “stand out” from the pack, just because it was now on the market. This just doesn’t happen in the real world, folks. 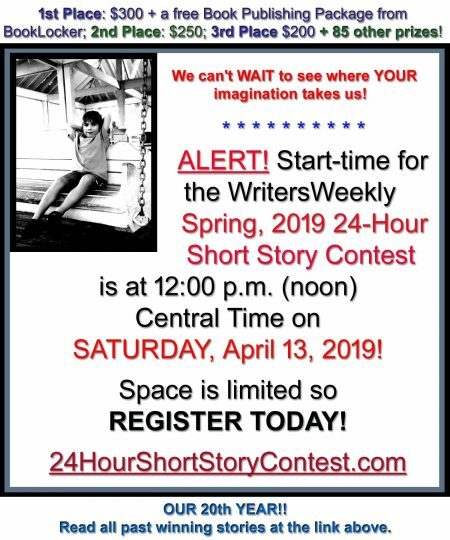 If you’re going to make a pretty pencil, or write a gnarly novel, you have to then pound the virtual pavement to get readers. If you don’t treat marketing your book like a full-time (or the very least, part-time) business, nobody is going to know about or buy your book. It’s that simple. If you’re not willing put on a sales cap and start touting your wares, don’t whine to your publisher and everybody else when nobody buys your book. 1. You Gotta Have Your OWN Website, Not One Owned/Controlled By Someone Else! Andy was a good self-promoting author. Once his book was published, he participated in online interviews, radio shows, and even landed a couple of local television appearances. He started to get noticed and people were buying his book. There were hundreds of websites that mentioned his publisher’s “Author Website” address. Unfortunately, he started hearing from readers that they were receiving books with upside pages, broken binding, and more. The complaints were starting to hurt Andy’s reputation and reviewers were even mentioning the poor quality of his books in their book reviews. Andy’s book was good but his publisher was not. He had to get out. He terminated his contract and hired another publisher (with a better reputation) to produce his book. The problem was, people were still seeing his old publisher’s “Author Website” address (URL) in all that press he’d generated over the previous several months. And, guess what the publisher had done with that URL? They were redirecting it to another book, published by them, that was on the same subject as Andy’s! Poor Andy checked his contract and discovered they did indeed own his “Author Website” because he’d terminated his contract with them. All his past online marketing efforts had been a waste of time. Andy realized that, even if he’d landed a traditional contract and not fired his publisher, or even if he terminated his contract because they failed to pay his royalties or defaulted on the contract for any reason at all, he’d still have lost complete control over the “author website” that he paid for! What Andy should have done from the very beginning was purchase his own URL, something like AuthorAndy.com. (I suggest authors try to purchase their name so they aren’t limited on the topics of their future books. For example, I own AngelaHoy.com). Had Andy purchased his own domain name and referred everyone to that in his marketing efforts, he could have simply changed the link for the “buy me” button on his own website to the new publisher’s page, or to Amazon.com, or wherever he chose to send his readers on any particular day. If you don’t have your own website, get one now. You can pick out your own domain ($9.99/year) and have access to “site builders” at godaddy.com. You could even have your own website up and running by the end of the day. As soon as you do, start using that domain name in all your marketing efforts. You can then simply put a “buy me” button on your new website and direct that link to your book’s page on your publisher’s site. There are lots of books on the market about how to make a website. But remember, you don’t need a huge website with multiple pages, graphics, and more. You really just need a marketing page and control over the “buy me” link! I’ve always said, the best way to sell a book online is to publish an ezine. Offer quality editorial on a regular basis (weekly, bi-weekly, monthly) and reach out to your readers via an ezine. Should you blog instead? I don’t recommend it. If you have a blog, you have to wait for people to come back to visit you. If you publish an ezine, you collect your potential readers’ email addresses (with their permission, of course!) and connect with them on your schedule (again, only if they’ve agreed to receive emails from you!). You don’t have to wait for them to remember to come back to visit because you’re reminding them on a regular basis. 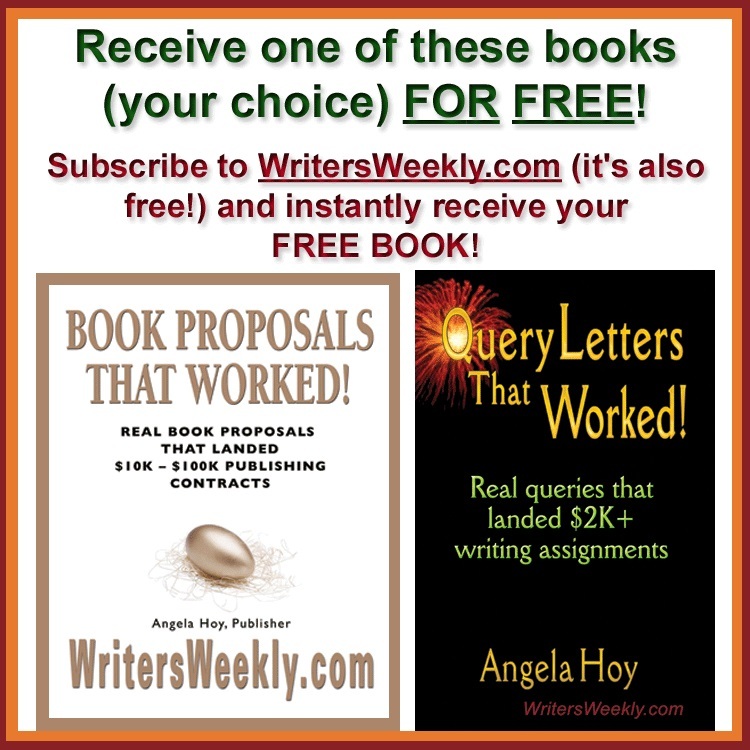 If your book is non-fiction, you can easily create quality, free editorial on a regular basis. 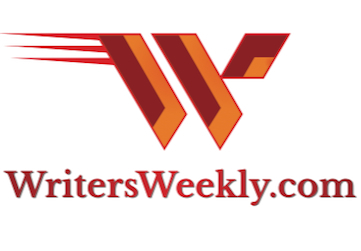 WritersWeekly.com (what you’re reading right now) is an example of this. 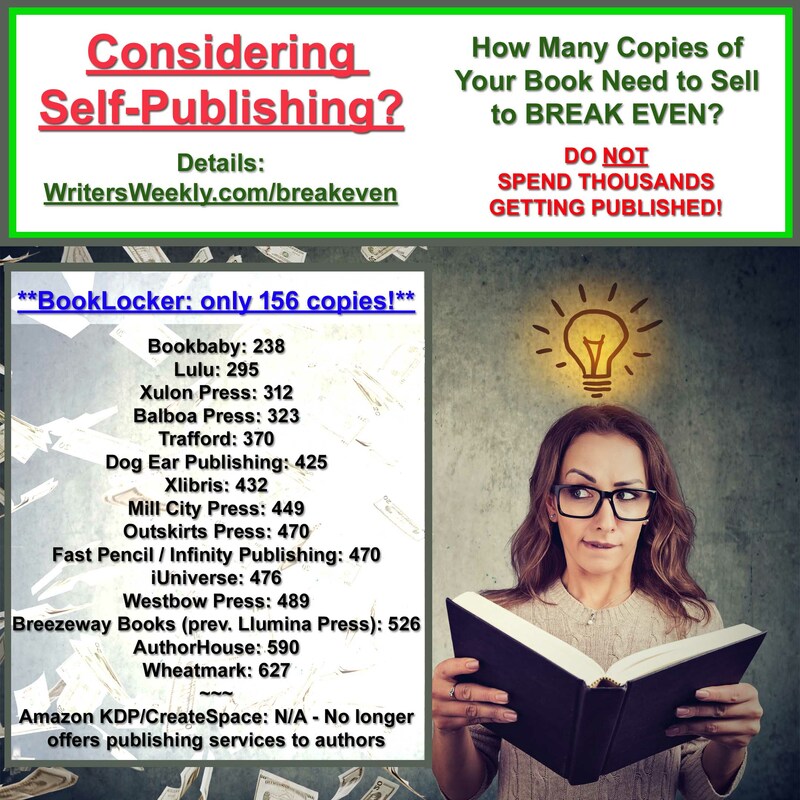 I give away free editorial each week in the form of paying jobs for writers, paying market listings, articles, and more, while I market my books (and books by other authors) and our publishing company, Booklocker.com, at the same time. Other – Consider having your main character (or other characters) converse with your readers through your ezine. My book, Profitable E-mail Publishing, is devoted to the topic of publishing ezines and is available not only in print but also for instant download for $8.95. You’ll notice it’s for sale on my own website where I have and will always control the “Buy” button. Next week, we’ll talk about expanding your marketing reach beyond your own website and ezine… for free.